The Napa Valley is recognized by collectors and critics alike as one of the greatest places on earth to grow and vinify the noble Cabernet Sauvignon grape. In the last two decades, the region has enjoyed successful vintage after successful vintage with Mother Nature giving top winemakers every opportunity to make the best wine possible. We have made it easy for you to browse our immense selection by vintage, and use this guide to reference growing conditions and vintage characteristics for each year. Enjoy! Napa Valley’s infamous cyclical drought was on its third year in 2014 which resulted in an early harvest once again. The fruit thrived during the stable growing season, and was reminiscent to the 2013 summer but with cooler nights. With lower temperatures at night, brighter acidity is evident in the wines from 2014 as well as aromatic expression and rich, striking tannins. Early tastings have shown how beautiful these wines are currently as well as their potential for long aging in your cellar. Click here to browse our inventory of California Cabernet from the 2014 Vintage! 2013 was a dream vintage for winemakers in Napa Valley producing Cabernet Sauvignon. A dry, long sunny summer allowed for the earliest harvest in more than 25 years and an overall ideal growing season. The clean, balanced fruit generated opulence and complexity in what was thought to be a more superior year than 2012. Critics and consumers alike have agreed that 2013 is one of the best vintages of Napa Cabernet in history. Click here to browse our inventory of California Cabernet from the 2013 Vintage! After two years of cooler weather in California, the 2012 vintage brought excellent growing conditions. The season was long and mild giving fruit ample time to develop. Vintners were thrilled with the quality and quantity of the harvest, comparing it to terrific years of the past like 2001, 2002, and 2007. All indications point to 2012 as a vintage for the ages. Click here to browse our inventory of California Cabernet from the 2012 Vintage! 2011 was a vintage for careful farming and wine making. Cool throughout, there was significant rain at both the beginning and end of the season. Leading to delayed bloom, shatter, and fruit that reached peak ripeness with lower sugar levels than average. Because of the long cool growing season grapes were able to develop great depth. Vintners who picked at the right moment made some delicious wines with higher acid and lower alcohol levels than are generally expected in Napa. While they tend not to have the huge opulent fruit aficionados have come to expect from Napa Cabernet, 2011’s can be wonderful wines for savvy shoppers looking for a great buy. Click here to browse our inventory of California Cabernet from the 2011 Vintage! Spring was wet in 2010 and the growing season began late. There was cool weather throughout except for a significant heat spike in late August which accelerated ripening. Harvest was smaller than average due to spring shatter and the late summer heat, but the grapes that made it were crafted into beautiful wines, that are balanced with fine tannin, rich fruit, and elegance that should make the prized wines for collectors far into the future. Click here to browse our inventory of California Cabernet from the 2010 Vintage! The tenth vintage of the new millennium did not disappoint, as the weather was ideal. The spring rains eliminated the early worries about drought, and a long, mild summer allowed for great ripening. A scare came with some mid-October rains, but only for the small percentage of Cabernet vineyards that had not yet been picked. The Cabernets from 2009 are balanced and elegant, and with modest tannins, many of them are a treat to drink now. We, however, think that the best wines from the vintage have the stuffing to go 20 years. Click here to browse our inventory of California Cabernet from the 2009 Vintage! A dry winter/spring and very late frosts started the growing season in ominous fashion. However a warm summer and light rains in September lead to ideal picking conditions in October. Spring calamities shrunk the final fruit yield and concentrated flavors, creating wines that were born to age for decades. Critics have been impressed as well, calling 2007 and 2008 the best two consecutive vintages since the mid-90’s. As with 2005, this is a vintage put in a dark corner of you cellar and forget about for a decade or more. Click here to browse our inventory of California Cabernet from the 2008 Vintage! In the tradition of 1994 and 2002, ‘perfect’ seems to be the favorite adjective of winemakers and critics when describing growing conditions. Critics continue to expound love letters to this vintage with every bottle that they taste and there is no doubt that examples of this vintage will be sought-after for decades to come. The wines are lush and opulent, already drinking well and will most likely continue to do so for the next two decades. Click here to browse our inventory of California Cabernet from the 2007 Vintage! A late starting and finishing year that was warm, but otherwise uneventful. 2006 seems to have become the forgotten vintage with the stellar 2007 and 2008 vintages that have proceeded. But make no mistake, collectors who prefer more balanced and food friendly wines may find that they prefer 2006 to 2007 with time. This vintage is undervalued in the market right now, stock-up before the best deals disappear! Click here to browse our inventory of California Cabernet from the 2006 Vintage! Cooler and longer growing season that was similar to 2001 with a larger crop. The best examples of the vintage show fantastic balance between ripe fruit flavors and ample structure for long term aging. If you are building a cellar for the long-haul, the Napa Cabs from 2005 should be acquired and allowed to sleep as long as your patience will allow. Click here to browse our inventory of California Cabernet from the 2005 Vintage! A warm growing season with a heat spike in late August that compressed harvest – the majority of fruit from The Valley was already in fermentors by the end of September. The resulting wines have proven to be big and ripe, best for garnering big scores from critics and drinking in the next decade. Click here to browse our inventory of California Cabernet from the 2004 Vintage! A primarily cool growing season with a hot spell in September that had growers racing to harvest fruit, 2003 was an irregular vintage. The best winemakers were successful, making early maturing wines that are drinking great right now. Overall the vintage has been undervalued in the market – look to 2000 and 2003 for the best deals from your favorite producers. Click here to browse our inventory of California Cabernet from the 2003 Vintage! A ‘perfect’ growing season that is often compared to 1994 – in weather conditions and resulting wines. Rich and extravagant fruit with enough structure to support, examples of the vintage drank well young and will continue to do so for at least another decade. Click here to browse our inventory of California Cabernet from the 2002 Vintage! Spring frosts provided a bumpy start to what was otherwise a very long and even growing season. Fruit that stayed on the vine well into fall developed big levels of tannin to go with supple fruit flavors – resulting in ripe, yet highly structured wines. 2001 will be a long-lived vintage – with many examples developing for two decades or more, however several bottles that we have recently tasted are already drinking well. Click here to browse our inventory of California Cabernet from the 2001 Vintage! Blistering mid-summer heat waves followed by October rains during harvest produced a vintage that was often given condescending reports by critics. Fast forward to that last few months here at Benchmark - several 2000 Cabernets have been tasted blind against other more desirable vintages like 1999 and 2001 with surprising results. Many tasters found the 2000 Cabs to be drinking very well, in a restrained style that is not often seen in modern Napa wines. If you prefer a little more acidity and secondary characteristics (with less opulence), savvy buyers can procure their favorite producer’s efforts from this vintage at an absolute steal. Click here to browse our inventory of California Cabernet from the 2000 Vintage! A long and somewhat cool growing season, some growers had a tough time with ripening but all produced highly structured fruit with great levels of acidity for balance. Much like 1995, this vintage will be very long lived with more than enough fruit concentration and balanced structure to go the distance. Put these in a dark corner of you cellar and let them sleep while you enjoy the more accessible wines in your cellar. Click here to browse our inventory of California Cabernet from the 1999 Vintage! Cool and wet year with record rainfall in the winter/spring. A late warm-up in October was the answer to many prayers, pushing fruit to acceptable levels of ripeness and saving the vintage from complete disaster. Critics have panned this vintage, pushing market demand and prices lower and lower. Savvy buyers who enjoy wines with lower alcohol levels can find amazing values here. Click here to browse our inventory of California Cabernet from the 1998 Vintage! An early spring followed by a cool, even summer had winemakers smiling throughout the valley all the way through July. A warming trend in late August and early September put a punctuation mark on the season, accelerating the fruit to ripeness. A very large crop of rich, opulent fruit was the result, producing some of the biggest wines of the decade. If you enjoy larger-framed, fruit-forward wines, 1997 is your vintage. Many wines are still quite young, but the prevailing modern style of many allows for early drinking. Click here to browse our inventory of California Cabernet from the 1997 Vintage! Considered by many as a "winemaker's vintage", an early spring followed by some rain during flowering and then heat spikes in summer, produced fruit of mixed quality. Those winemakers that did the work of removing the lower quality fruit were rewarded with fleshy and ripe wines that were just a step off the quality of '94. And much like the 1994 vintage, these wines are showing very nicely now - resolved structure has left very silky texture with interesting secondary notes. Enjoy over the next few years. Click here to browse our inventory of California Cabernet from the 1996 Vintage! A wet, cool winter contributed to a late start in the growing season, but was then punctuated by intense heat in the middle of the summer. While the growing conditions were not ideal, this vintage managed to produce surprisingly balanced, yet structured wines - many critics consider the vintage to be equal to 1994, but very different in style. Our recent tastings have shown wines that are still quite fresh, with more than enough structure to carry another decade. Let these sleep while you enjoy your '94/92/91 Cabernets. Click here to browse our inventory of California Cabernet from the 1995 Vintage! A warm spring gave a jump on budbreak, bloom and verasion, but was followed by a mild summer and slow ripening. Cool harvest days further helped to maintain acidity to balance the very ripe fruit. Wines were showy when young, and have aged extremely well. In our opinion, this is one of the best drinking vintages of Napa Cabernet right now. Structure has resolved, leaving complex and supple wines that are an absolute joy. Click here to browse our inventory of California Cabernet from the 1994 Vintage! A wet winter finally broke six previous years of drought, but was followed by a rollercoaster of high and low temperatures through the growing season. A final August heat wave sent a panic through the Valley, but relief came with a cooling trend in September and though harvest. Most definitely a “winemaker’s vintage”, the fruit quality was variable and required strict selection in the winery. The best wines were structured and balanced for aging, and recent tastings have shown that to be the case. Click here to browse our inventory of California Cabernet from the 1993 Vintage! Described as a "perfect" growing season by many wineries and critics, indeed the warmer weather left little doubt of fruit reaching full ripeness. The sixth consecutive year of drought, soil moisture was at a premium which helped concentrate flavors and keep yields down. The wines were very rich and supple from release. Recent tastings of this vintage has shown delightful wines that are great drinking well now, but are in no danger of fading any time soon. Click here to browse our inventory of California Cabernet from the 1992 Vintage! Exceptionally long growing season due to lower than normal temperatures. A warm-up in the late summer ended fears of under-ripe fruit, allowing growers to pick before the rains came. The crop was big and managed to produce fruit that was ripe yet very complex due to long hang times. Bottles that we recently tasted from 1991 have been at peak, with plenty of life still left. Buy and enjoy now while your younger bottles sleep. Click here to browse our inventory of California Cabernet from the 1991 Vintage! Late spring rains during bloom reduced crop size by 20 to 30%, however spring gave way to a mild and uneventful summer, producing even ripeness and intense fruit flavors. The Valley was also seeing a new wave of talented winemakers who took advantage of the great growing conditions, producing the best vintage since 1985. The class of 1990 is well into its prime drinking window, sample a few bottles from your favorite producers to get a glimpse of what a great aged California Cabernet can be. 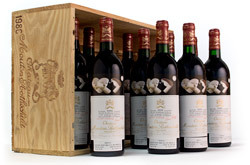 Click here to browse our inventory of California Cabernet from the 1990 Vintage! Submit your collection for a complimentary appraisal today!